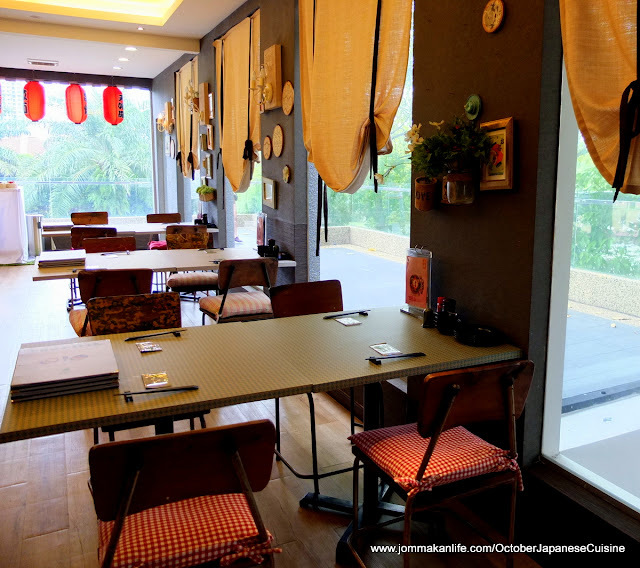 REUNION is the name of the Chinese New Year theme at October Japanese Cuisine in Johor Bahru. 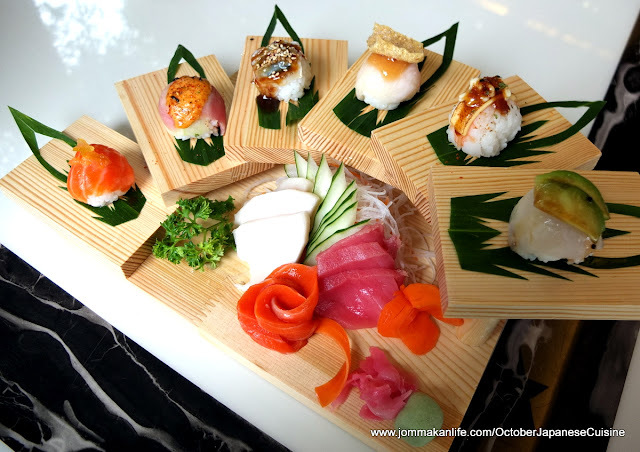 Swim into the CNY mood with the restaurant’s Prosperity Assorted Sashimi Yee Sang (RM68 nett – regular, RM108 nett - large) with Wasabi Sauce or Sour Plum Sauce. 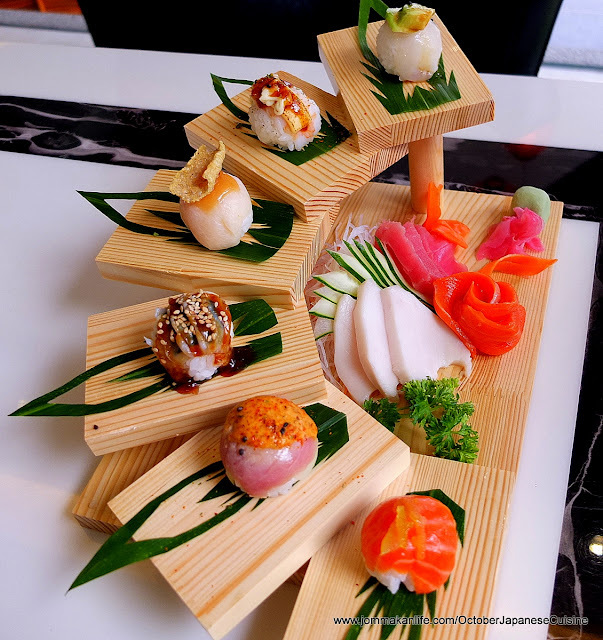 We sampled the refreshing salad that combined Norwegian Salmon, Maguro (Tuna) and Hamachi (Yellow Tail) harmoniously with mounds of colourful, shredded radish, carrot, cucumber, seaweed, pickled ginger and marinated scallop skirts. 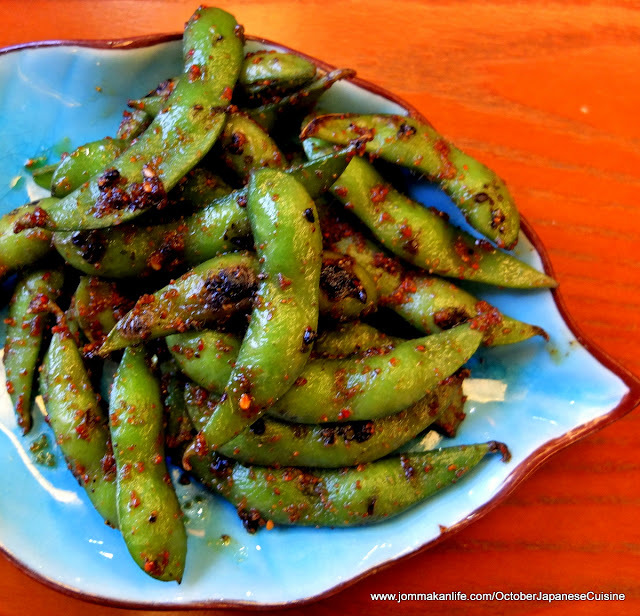 Lending further textural interest to the ensemble were house-made fried Gyoza Skin, Sesame Seeds and Toasted Almond Flakes. 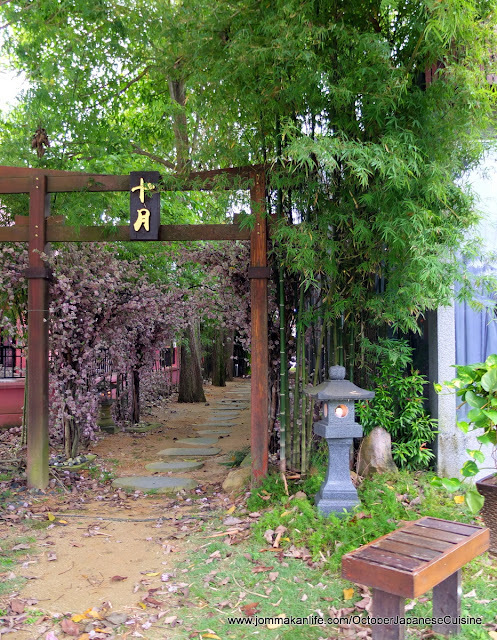 Tucked away in a quiet enclave, the low-rise, double-storey resto comes with a sculpted pathway on one side - complete with Japanese bamboo, granite garden lanterns, stone paving, faux cherry blossom trees and a torii (traditional gate). 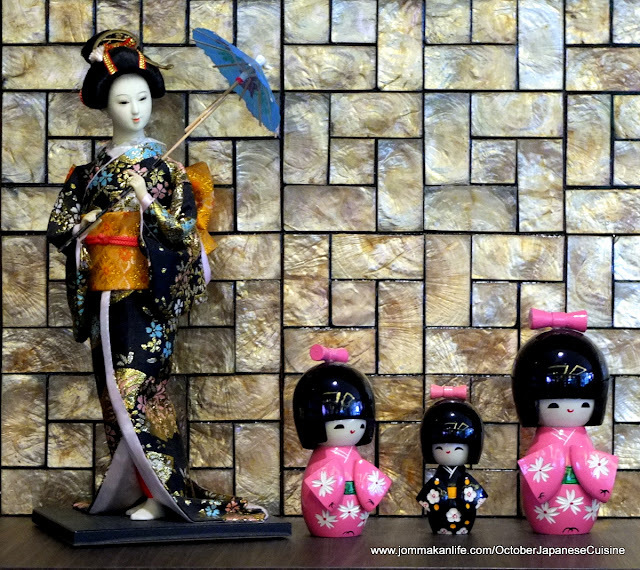 The resto interior is simple and practical with an open display of sumo wrestlers and sake bottles. 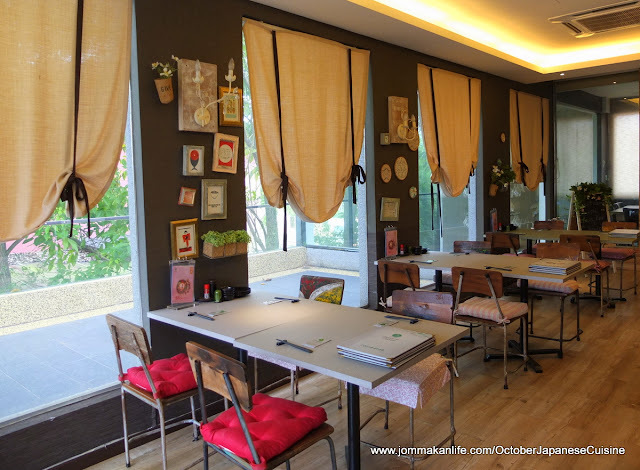 Upstairs features more laidback cafe-style seating and a private dining room. 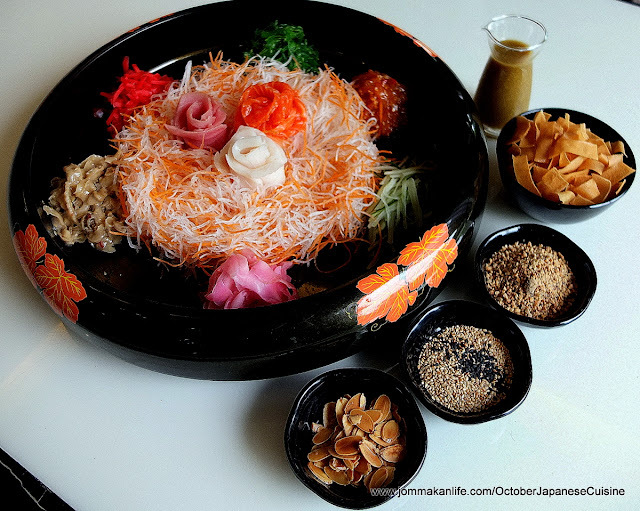 To fire up the festive spirit, the October team has created Auspicious Flaming Nabe (RM68.80 nett), a hot pot flambé with Kaoliang Rice Wine, Japanese Sake and Miso Soup. 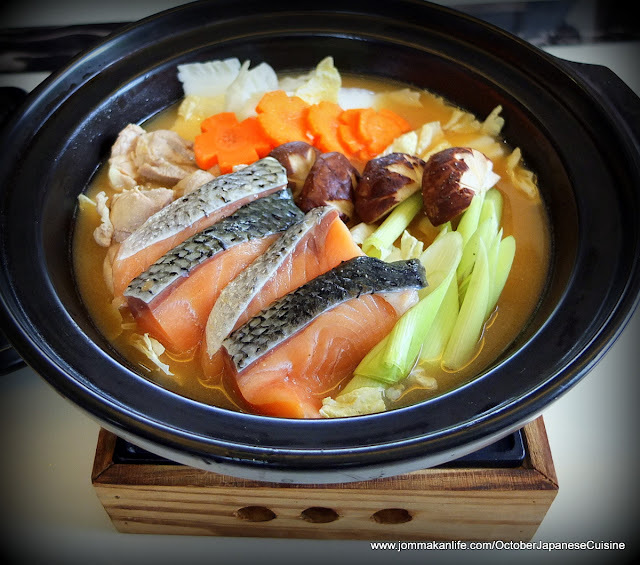 Sliced Norwegian salmon, chicken breast, shiitake mushrooms, leeks and carrots co-mingled in the bubbling pot; their inherent sweetness imbued with a decidedly heavy boozy overtone once the spirits were added and set alight. 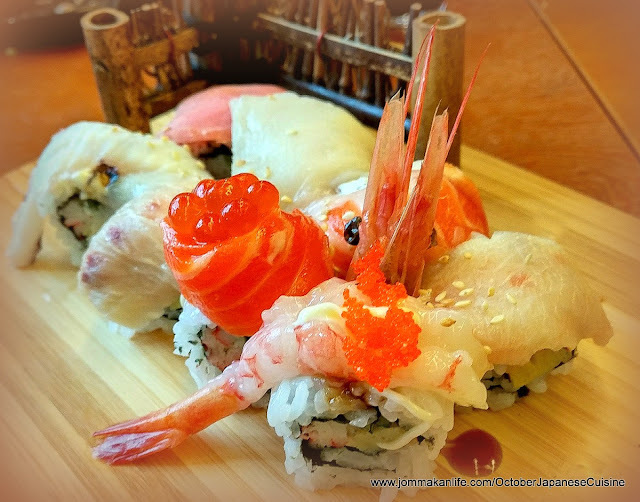 Have a ball of a time with the artistic creation of Fortune Sushi & Sashimi Platter (RM58.80 nett). 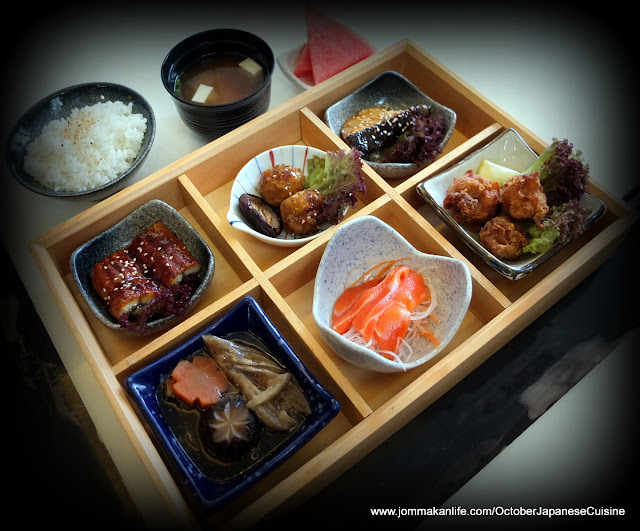 The dainty assortment of sushi balls was delightful, nicely complemented by slices of Maguro, Hamachi and Salmon Sashimi as well as Ikura (Salmon Roe). Customers who spend RM88 and above will be entitled to receive two packs of exclusive October Group ang pows and a RM20 voucher in conjunction with CNY. 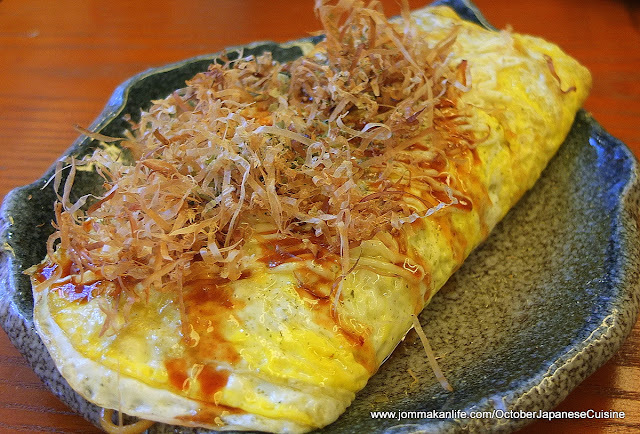 The extensive a la carte menu also abounds with tempting possibilities. 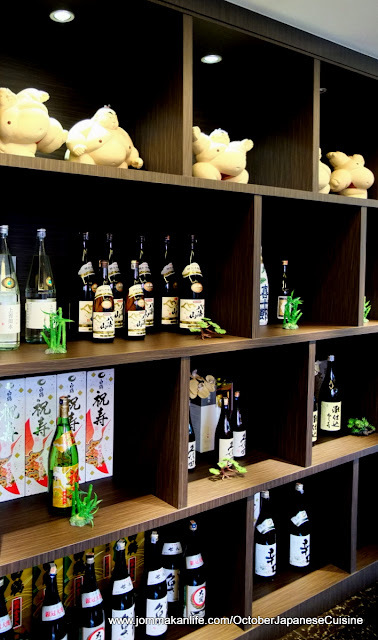 You can nurse a fave tipple and nibble on Grilled Edamame (RM9.90++) – Japanese green soya beans sautéed with togarashi seasoning and Kawahagi (RM12.90++) – smoky, mildly salty dried leatherjacket or filefish with jerky-like chewiness. 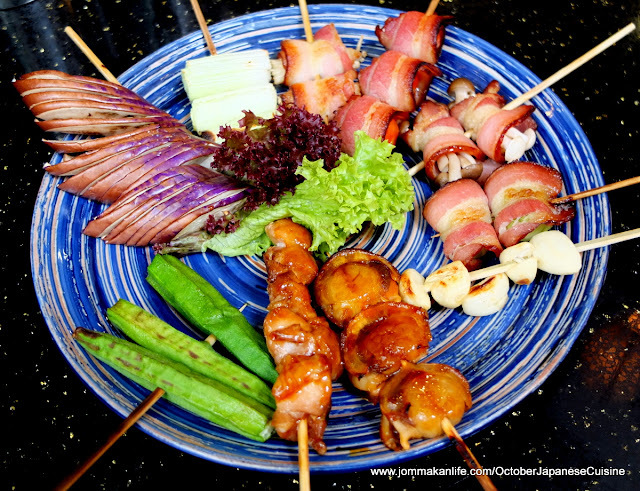 Also available are palate-pleasing Kushiyaki Moriawase (RM44.90++): grilled skewers of scallops, shiitake, enoki niku, okra, leek and eggplant to assuage hunger pangs. 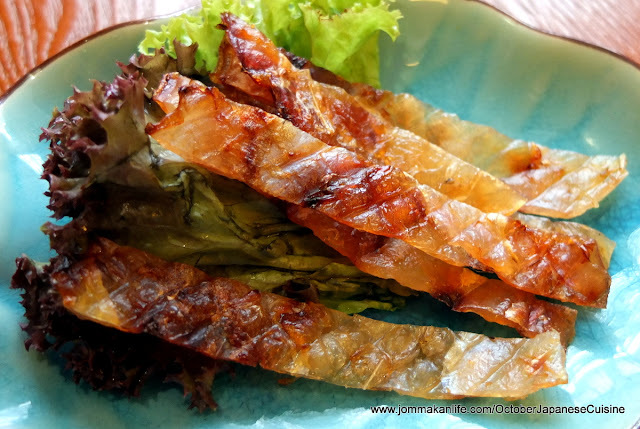 We would recommend Surume Ika – tender grilled squid basted with Japanese sauce. 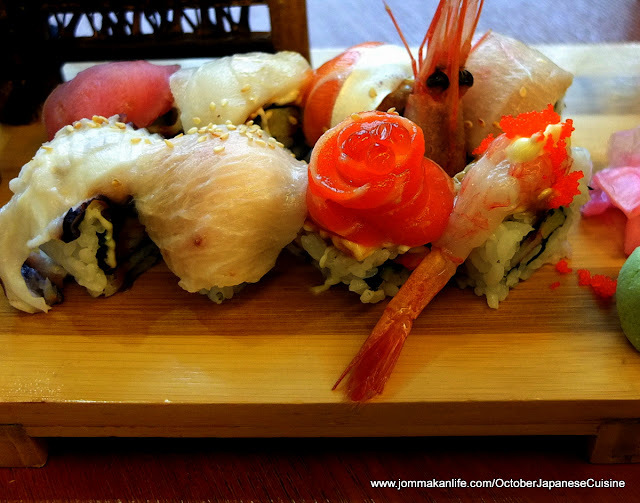 Rice fiends will find rolled sushi aplenty to tickle their fancy. 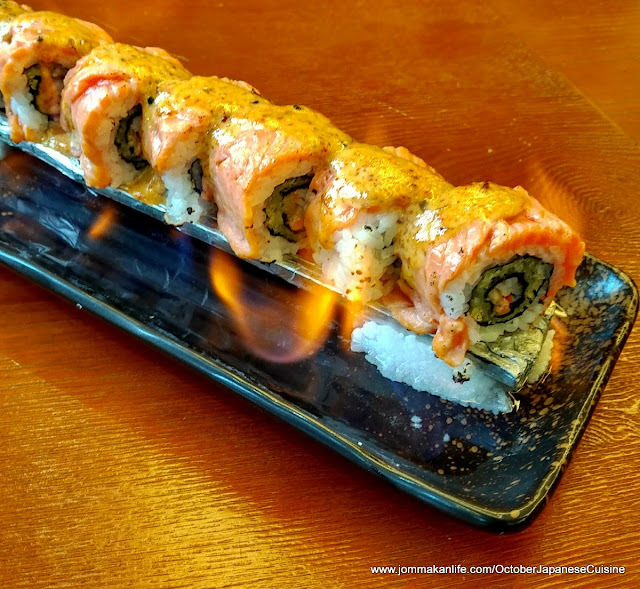 The Special October Maki (RM49.90) consists of 8 types of sushi whilst salmon, crabstick and lashings of spicy sauce made up the Flaming Salmon Aburi Maki (RM29.90++). 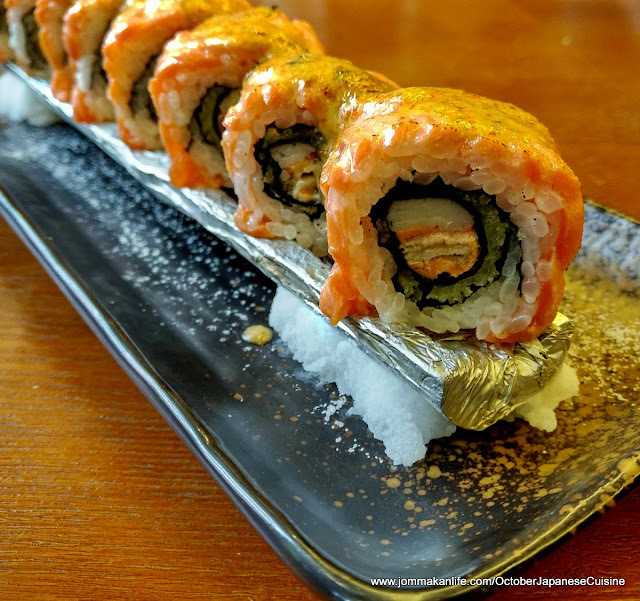 Riding on the salted egg craze is October’s Salted Egg Maki (RM26.90++) in which a deep-fried soft shell crab rolled sushi comes laced with savoury salted egg sauce. 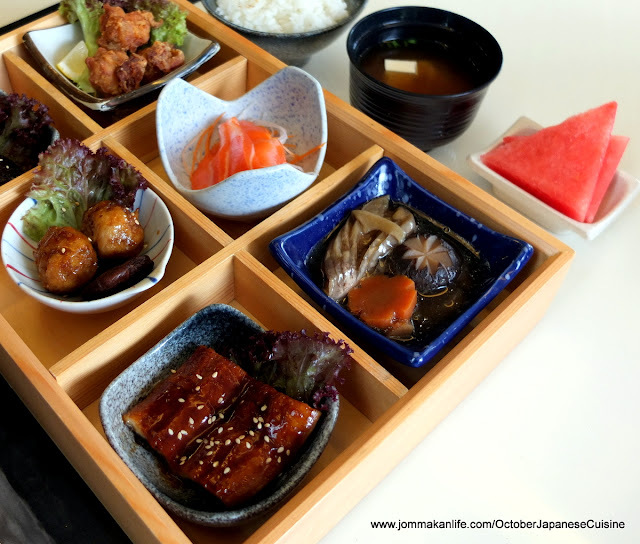 Heftier appetites may prefer opting for the October Special Bento (RM59.90++) – a bento encompassing Japan’s seasonal ingredients prepared in multiple ways to please the eyes and palate. 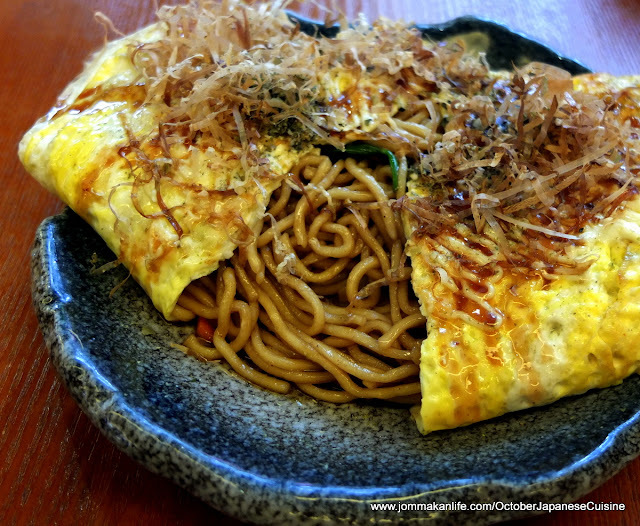 Should you need additional succour, the generous serving of Japanese Fried Noodles (RM19.90) wrapped in a fluffy omelette blanketed with katsuoboshi will do the trick. 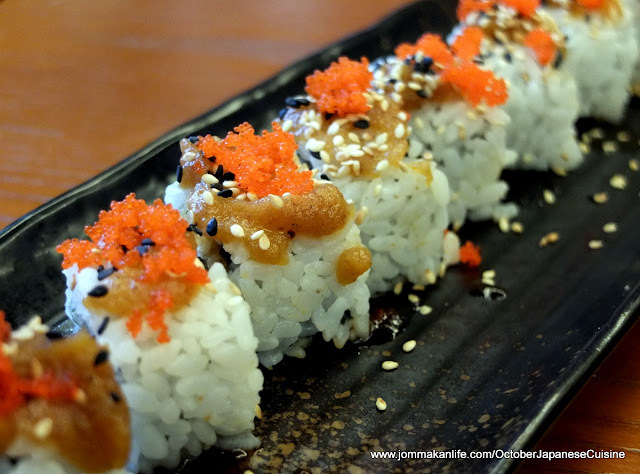 To wrap up your outing to October, sweeten the experience with Tempura Sweet Potato (RM9.90++). 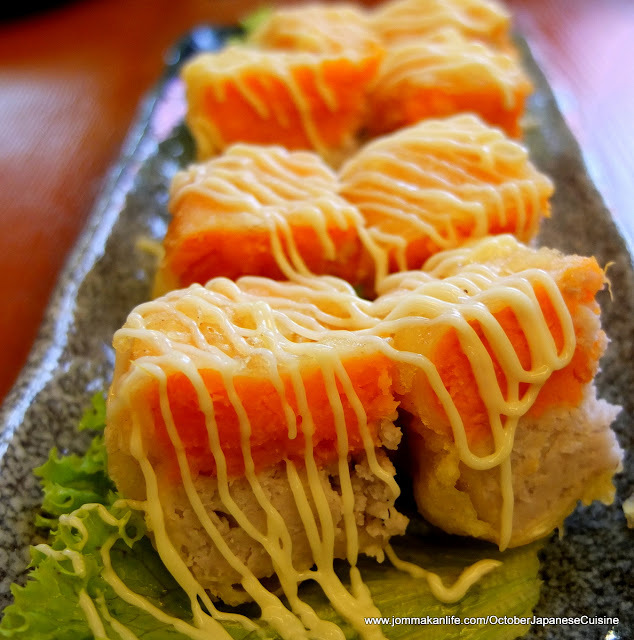 Inspired by the local combo of sweet potato and yam, this pairing sheathed in light tempura batter. Tartar sauce gave the dish an unexpectedly lush and creamy twist. 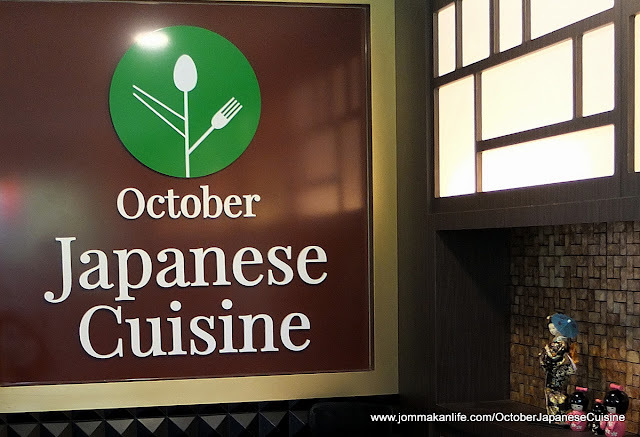 For reservations, call October Japanese Cuisine, tel: 017-683 2156. 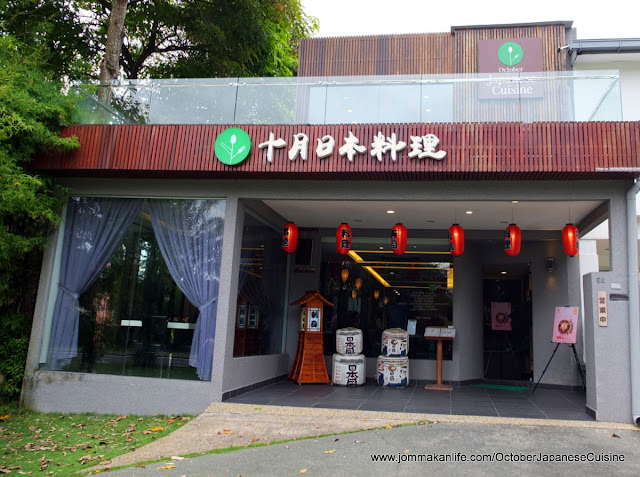 Address: 6A, Jalan Persiaran Jaya Putra 1, Bandar Jaya Putra (JP Perdana) Johor Bahru.